Location of Moscow in Latah County, Idaho. First United Methodist Church (1904), S. Adams at E. 3rd St.
Moscow ( /ˈmɒskoʊ/ MOS-koh) is a city in northern Idaho along the state border with Washington, with a population of 23,800 at the 2010 census. 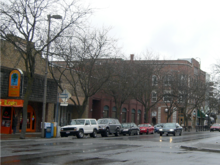 The county seat and largest city of Latah County,  Moscow is the home of the University of Idaho, the state's land grant institution and primary research university, as well as the home of New Saint Andrews College, a Christian liberal arts college. It is the principal city in the Moscow, Idaho Micropolitan Statistical Area, which includes all of Latah County. The city contains over 60% of the county's population, and while the university is Moscow's dominant employer, the city also serves as an agricultural and commercial hub for the Palouse region. Along with the rest of northern Idaho, Moscow is in the Pacific Time Zone. The elevation of its city center is 2,579 feet (786 m) above sea level. Major highways serving the city are US-95 (north-south) and ID-8 (east-west), both of which are routed through central Moscow. Limited commercial air service is four miles west (6 km) at the Pullman-Moscow Regional Airport. Main Street runs north-south through Moscow along the 117th meridian west. There is a variety of flora and fauna within the vicinity of Moscow. An amphibian, the Rough-skinned Newt, has a disjunctive population at Moscow; this species is found typically along the Pacific coast of the USA. The city sits at the boundary between the Palouse grasslands and wheat fields, and the conifer forests of the Rocky Mountains to the east. Miners and farmers began arriving in the northern Idaho area after the Civil War. The first permanent settlers came to the Moscow area 148 years ago in 1871. The abundance of camas bulbs, a favorite fodder of pigs brought by the farmers, led to naming the vicinity "Hog Heaven." When the first US post office opened in 1872, the town was called "Paradise Valley," but the name was changed to "Moscow" in 1875. The name Paradise persists with the main waterway through town, Paradise Creek, which originates at the west end of the Palouse Range, flows south to the Troy Highway, and west to Pullman where it enters the South Fork of the Palouse River. The business district was established by 1875 and the town was a center of commerce for the region. By 1890, the Oregon Railroad and Navigation Company's rail line (later the Union Pacific) and the Northern Pacific railroad line helped to boost the town's population to 2,000. I called ex-Governor William J. McConnell [Republican, 1893-1897, 1839-1925], who was on the ground when the name was selected. He advises there is very little history in connection with the name. A Russian from Moscow, Russia, established a trading post here, where Moscow now stands, and they decided to name it Moscow after his native city in Russia. Previous to locating Moscow, there was a trading post about one mile southeast of here. The above mentioned Russian was successful in getting a post office here, and the trading post, which was known as Paradise Valley, was abolished. The surrounding country was known as Horse Heaven Country, account grass grew well, and the Indians grazed large herds of horses. Original document at the University of Montana, Mike and Maureen Mansfield Library, K. Ross Toole Archives, Collection 178, Box 210, Folder 10. In March 1890, Moscow's neighboring city, Pullman, was selected as the home of Washington's land grant institution. The college which became Washington State University opened its doors in January 1892. Washington entered the union as the 42nd state in November 1889 and Idaho entered next, eight months later, in July 1890. In 1904, the committee planned to raise funds for a new library building. Andrew Carnegie promised funding of $10,000 if the community agreed to maintain a free public library at the rate of at least $1000 annually. Moscow voters approved a permanent tax in 1905 and with successful fundraising by subscription of local residents and businesses, coupled with the Carnegie library money, the library construction was begun in 1905. In March 1906, the Mission Style building was ready for occupancy. Later that month, a fire at the university's Administration Building totally destroyed that structure, so the new library was used for university classes during the day and residents used the library in the evening. Beginning in 1907 the building was returned to full use as a library. The original library building (which is on the National Register of Historic Places) was expanded in 1931 and 1983. It houses a children's room named for Moscow native Carol Ryrie Brink, the author of 1936 Newbery Medal winner Caddie Woodlawn. The Moscow Public Library currently houses about 60% of Latah County Library District's 100,000 volume collection. Administrative, technical, youth services, and branch services offices for the Library District are all housed at this location as well. The library offers year-round programming for all ages, including storytimes and a summer reading program for children, book clubs for teenagers and adults, and presentations by outside experts and organizations. The library also offers public Internet access computers as well as free wifi. Pullman–Moscow Regional Airport is five miles (8 km) west, just east of the Washington State University campus. Other nearby airports are the Lewiston-Nez Perce County Airport, 34 miles (55 km) south, and Spokane International, ninety miles (140 km) north. Amtrak passenger train service is available in Spokane, and there is a bus station in downtown Moscow. Bus service is to Spokane northbound and Boise southbound through Northwestern Trailways. Wheatland Express also provides service to Spokane. Maypole Dancers in East City Park. There are seventeen neighborhood parks located throughout the town offering a wide variety of venues for outdoor activities. These parks fall under the jurisdiction of the Moscow Parks and Recreation Department. The Moscow Pathways Commission  (formerly Paradise Path Task Force) is a citizen committee seeking to develop a system of linearly connected parks throughout the area. Carol Ryrie Brink Nature Park was a community collaboration between the Palouse Clearwater Environmental Institute and local volunteers to remeander Paradise Creek and add riparian plantings. The Moscow community, including schools and the city, led by local youth, raised money over several years to fund, design, and build a skate park which was completed in 2000. The Latah Trail, completed in October 2008, extends from the eastern edge of Moscow bike path system to Troy, parallel to the Troy Highway (SH-8) for most of its 12 miles (19 km). On the west side of Moscow, the Bill Chipman Palouse Trail connects the two university communities of the Palouse. Starting at the University of Idaho's Perimeter Road, it gradually descends with Paradise Creek for 8 miles (13 km) to Pullman through Whitman County, alongside the Moscow-Pullman Highway. Completed in April 1998,  the trail honors a Pullman businessman (and UI alumnus) who died two years earlier, following a winter highway accident in Spokane County. The Paradise Path bridges the gap in Moscow between the endpoints of the Chipman and Latah trails, passing through the north and east edges of the UI campus. 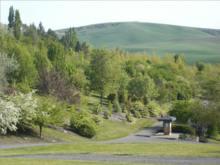 The trail systems together constitute a continuous 22-mile (35 km) paved linear park from Pullman to Troy, extending in Troy beyond the eastern boundary of the Palouse ecosystem. From Pullman to the western boundary of Moscow (the state line), it follows the right of way of a dismantled Union Pacific railroad line, and east of US-95 it follows the right of way of a dismantled BNSF railroad line that junctioned at Arrow on the Clearwater River by way of Troy, Kendrick, and Juliaetta. 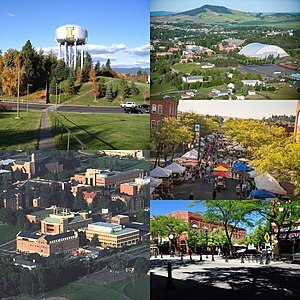 The University of Idaho (officially abbreviated UI, locally referred to as "U of I") is the U.S. state of Idaho's oldest public university, located in the city of Moscow in Latah County in the northern portion of the state. It is the state's flagship, land-grant, and primary research university. The University of Idaho was the state's sole university for 71 years, until 1963, and its College of Law, established in 1909, was first accredited by the American Bar Association in 1925. Formed by the territorial legislature on January 30, 1889, the university opened its doors in 1892 on October 3, with an initial class of 40 students. The first graduating class in 1896 contained two men and two women. It presently has an enrollment exceeding 12,000, with over 11,000 on the Moscow campus. The university offers 142 degree programs, from accountancy to wildlife resources, including bachelor's, master's, doctoral, and specialists' degrees. Certificates of completion are offered in 30 areas of study. At 25% and 53%, its 4 and 6 year graduation rates  are the highest of any public university in Idaho, and it generates 74 percent of all research money in the state, with research expenditures of $100 million in 2010 alone. There are two public charter schools Moscow Charter School (K-8) and Palouse Prairie School of Expeditionary Learning (K-8). In addition there are three private schools, Logos School (K-12), St Mary's School (K-8), and Palouse Hills Christian School (K-8). As of the census  of 2010, there were 23,800 people, 9,180 households, and 4,335 families residing in the city. The population density was 3,474.5 inhabitants per square mile (1,341.5/km2). There were 9,879 housing units at an average density of 1,442.2 per square mile (556.8/km2). The racial makeup of the city was 90.9% White, 1.1% African American, 0.6% Native American, 3.1% Asian, 0.2% Pacific Islander, 1.4% from other races, and 2.7% from two or more races. Hispanic or Latino of any race were 4.6% of the population. There were 9,180 households of which 22.9% had children under the age of 18 living with them, 37.8% were married couples living together, 6.1% had a female householder with no husband present, 3.4% had a male householder with no wife present, and 52.8% were non-families. 31.3% of all households were made up of individuals and 6.6% had someone living alone who was 65 years of age or older. The average household size was 2.26 and the average family size was 2.91. The median age in the city was 24.2 years. 16.4% of residents were under the age of 18; 36.1% were between the ages of 18 and 24; 24.7% were from 25 to 44; 15.6% were from 45 to 64; and 7.4% were 65 years of age or older. The gender makeup of the city was 51.8% male and 48.2% female. Hispanic or Latino of any race were 2.47% of the population. There were 7,724 households out of which 24.2% had children under the age of 18 living with them, 41.0% were married couples living together, 6.4% had a female householder with no husband present, and 49.9% were non-families. 29.9% of all households were made up of individuals and 5.5% had someone living alone who was 65 years of age or older. The average household size was 2.25 and the average family size was 2.87. The median age was 24 years. For every 100 females, there were 109.3 males. For every 100 females age 18 and over, there were 110.1 males. The median income for a household in the city was $26,884, and the median income for a family was $46,331. Males had a median income of $35,494 versus $24,560 for females. The per capita income for the city was $14,930. About 9.5% of families and 22.4% of the population were below the poverty line, including 8.2% of those under age 18 and 4.5% of those age 65 or over. 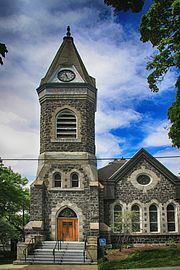 Listed on the National Register of Historic Places; open for tours by the Latah County Historical Society. Moscow has a Council-Mayor form of government consisting of six Council members (at large) and a Mayor. These positions are elected separately and serve four year terms. Council member elections are held in odd-numbered years in November, with terms staggered so that three of the six seats are open at each election. Mayoral elections are held the November after a US Presidential election (e.g., most recently in 2017). Moscow tends to be less politically conservative than the rest of the state. In the 2004 Presidential Election, John Kerry out-polled George W. Bush in Moscow 54%-46%. Latah County was 49.5%-48.0% for the Bush/Cheney ticket; the entire state of Idaho went 68%-30% for George W. Bush. In the 2008 Presidential Election, Democrat Barack Obama won Moscow and Latah County 52%-45% while losing statewide 61%-36%. In 2000 Latah county went to Republican George W. Bush 53% to Democrat Al Gore's 36% and Independent Ralph Nader's 6%, The state of Idaho went to Bush 67%, to Gore 27%, with Nader at 2%. According to the Köppen climate classification system, Moscow has a dry-summer continental climate ( Köppen Dsb). ^ "Geographic Names Information System". U.S. Geological Survey. U.S. Department of the Interior. 1979. Retrieved 2007-03-26. ^ Cronin, Amanda (2003). "Restoring Paradise in Moscow, Idaho". Land and Water : the magazine of natural resource management and restoration. Land and Water, Inc. 47 (2): 18–26. ISSN 0192-9453. Retrieved 2007-03-28. ^ Gunter, Mickey (1995). "Geologic history of Latah County, Idaho". Mineralogy of Latah County, Idaho. Archived from the original on 2004-06-15. Retrieved 2007-03-26. ^ Monroe, Julie R. (2003). Moscow: Living and Learning on the Palouse. Charleston, SC: Arcadia Publishing. pp. 30–31. ISBN 0738524255. OCLC 52263784. ^ Gunther, John (1947). Inside U.S.A. New York, London: Harper & Brothers. p. 114. ^ Latah County Historical Society. "Town histories". History of Latah County. Retrieved 2007-03-25. ^ Schwantes, Carlos (2007). "Brief History of the University of Idaho". About the University of Idaho. University of Idaho. Archived from the original on February 4, 2007. Retrieved 2007-04-16. ^ Reed, Mary (February 7, 1987). "Women's group started library plans rolling". Idahonian. Moscow. (Latah County Historical Society). p. 10. ^ Spurling, Carol Price (2006). "Moscow Public Library : a century of service 1906-2006". Moscow, Idaho: Moscow Public Library. ^ "Moscow Mall moves closer to completion". Lewiston Morning Tribune. (Idaho). July 9, 1978. p. 1D. ^ Cross, Helen (April 30, 1976). "Mall, other facilities rising at Moscow". Spokane Daily Chronicle. (Washington). p. 3. ^ "Is Moscow Mall for sale? It depends on who's talking". Lewiston Morning Tribune. (Idaho). November 15, 1979. p. 2C. ^ a b "Moscow, Idaho (original brick buildings map)". University of Idaho Library: Ott Historical Photograph Collection. c. 1970. Retrieved September 5, 2012. ^ "Road cost cut seen". Spokesman-Review. (Spokane, Washington). June 21, 1972. p. 7. ^ "Moscow Main Street will be ready for traffic Aug. 24". Lewiston Morning Tribune. (Idaho). August 14, 1981. p. 2B. ^ a b "Which way do I go?". Gem of the Mountains, University of Idaho yearbook. Spring 1982. p. 34. ^ a b "One way or another". Argonaut. (Moscow, Idaho). (University of Idaho). August 25, 1981. p. 4. ^ Long, Ben (July 27, 1991). "A decade of difference". Idahonian. (Moscow). p. 1A. ^ a b "Moscow agrees to traffic changes". Lewiston Morning Tribune. (Idaho). July 8, 1980. p. 1B. ^ "United Paving low bidder for Moscow couplet". Lewiston Morning Tribune. (Idaho). December 3, 1980. p. 8B. ^ a b McCann, Sheila R. (June 23, 1989). "Interest stirs again for long-delayed interchange on U.S. 95". Idahonian. (Moscow). p. 1A. ^ Long, Ben (December 7, 1990). "Roadwork ends party in half of Corner Club". Idahonian. Moscow. p. 1A. ^ Long, Ben (January 9, 1991). "A real bar bash: Corner Club demolished". Idahonian. (Moscow). p. 1A. ^ Bartlett, Maureen (January 15, 1991). "Local "watering hole" torn down". Argonaut. (Moscow, Idaho). (University of Idaho). p. 17. ^ Johnson, David (September 2, 1979). "To the Club for a tub!". Lewiston Morning Tribune. Idaho. p. 1B. ^ "Idaho Hotel". University of Idaho Library: Ott Historical Photograph Collection. 1975. Retrieved September 3, 2012. ^ Cross, Helen (May 27, 1977). "Hotel yields to cars". Spokane Daily Chronicle. (Washington). p. 3. ^ "Formerly the Location of the Idaho Hotel". University of Idaho Library: Ott Historical Photograph Collection. July 13, 1977. Retrieved September 3, 2012. ^ Long, Ben (June 4, 1991). "Crews start rerouting Moscow street". Idahonian. (Moscow). p. 12A. ^ Goetsch, Lara (July 10, 1991). "1st traffic flow through Moscow couplet". Idahonian. (Moscow). p. 12A. ^ "Clarkston firm wins Moscow project". Moscow-Pullman Daily News. (Idaho-Washington). March 27, 1992. p. 12A. ^ LaBoe, Barbara (December 17, 1994). "South couplet back to drawing board". Moscow-Pullman Daily News. (Idaho-Washington). p. 10A. ^ a b LaBoe, Barbara (May 16, 1995). "City makes pitch for south couplet". Moscow-Pullman Daily News. (Idaho-Washington). p. 10A. ^ Boswell, Nina (April 25, 1998). "Moscow will move ahead with couplet". Moscow-Pullman Daily News. (Idaho-Washington). p. 1A. ^ "Moscow work will divert traffic". Lewiston Morning Tribune. (Idaho). July 27, 2000. p. 7A. ^ Trillhase, Marty (April 10, 1987). "Late birthday means two-year wait to drink". Idahonian. (Moscow). p. 1. ^ "In Idaho, be 19 today, or gone tomorrow". Spokane Chronicle. (Washington). Associated Press. April 10, 1987. p. 1. ^ "Bar business boom?". Spokesman-Review. (Spokane, Washington). June 30, 1972. p. 9. ^ "Idahoans to see several changes". Spokane Daily Chronicle. (Washington). UPI. June 30, 1972. p. 6. ^ "The Palouse in review: #3 - A new legal drinking age". Idahonian. Moscow. January 1, 1988. p. 1A. ^ "Bills lower drinking age to 19 in Idaho". Spokesman-Review. (Spokane, Washington). Associated Press. March 18, 1972. p. 1. ^ "Moscow, Idaho, second in air series, shows its postwar growth". Spokesman-Review. (Spokane, Washington). (aerial photo). July 21, 1952. p. 14. ^ Mills, Joel (February 13, 2007). "Moscow skyline is getting a new look". Lewiston Tribune. (Idaho). p. 1A. ^ "SW corner, 8th & Main streets". University of Idaho Library: Ott historical photograph collection. 1930. Retrieved September 1, 2012. ^ Mills, Joel (March 25, 2007). "Going down". Lewiston Tribune. (Idaho). p. 1A. ^ "Wrecking ball of change". Moscow-Pullman Daily News. (Idaho-Washington). March 16, 2007. p. 1A. ^ "6th & Jackson streets". University of Idaho Library: Ott historical photograph collection. July 31, 1980. Retrieved September 1, 2012. ^ "Latah County Grain Growers Inc - Miller Elevator - Moscow ID". Waymarking.com. Retrieved September 1, 2012. ^ Drawhorn, Omie (February 20, 2007). "Grain elevators to be spared". Moscow-Pullman Daily News. (Idaho-Washington). p. 1A. ^ "Group buys Moscow grain elevator, saving it from destruction". Ag Weekly. Associated Press. July 28, 2007. Archived from the original on 2013-01-16. Retrieved September 1, 2012. ^ Mills, Joel (July 23, 2007). "Investment group keeps Moscow elevator standing". Lewiston Tribune. (Idaho). p. 4A. ^ Geranios, Nicholas K. (February 11, 2012). "New Moscow theater located in grain silo". Seattle Times. Associated Press. ^ "Moscow Pathways Commission". Ci.moscow.id.us. Archived from the original on 6 April 2016. Retrieved 27 August 2017. ^ LaBoe, Barbara (April 6, 1998). "All-weather trail: rain doesn't dampen the fun as Chipman trail officially opens". Moscow-Pullman Daily News. Idaho-Washington. p. 1A. ^ "Pullman businessman remembered as man of integrity". Moscow-Pullman Daily News. Idaho-Washington. January 11, 1996. p. 1A. ^ "Bill Chipman hospitalized after accident". Moscow-Pullman Daily News. Idaho-Washington. December 16, 1995. p. 10A. ^ "Ghormley Park". City of Moscow. Archived from the original on 30 April 2014. Retrieved 2 March 2013. ^ White, Vera (December 3, 1990). "Warm humor, cold line". Idahonian. Moscow. p. 1A. ^ Kershner, Jim (November 29, 1990). "Yakov: live from Moscow...Idaho". Spokesman-Review. Spokane, Washington. p. C1. ^ Anzelowitz, Lois (March 8, 1991). "Back to the USSR". EW.com. Retrieved December 8, 2012. ^ "There's Been An Error!" (PDF). idaho.gov. Archived from the original (PDF) on May 5, 2012. Retrieved 7 March 2015. ^ "Source: Vandals dropping to FCS, joining the Big Sky". Idahostatesman.com. Retrieved 27 August 2017. ^ Bacharach, Alexis (January 26, 2005). "President not surprised by opposition to college". Moscow-Pullman Daily News. Idaho-Washington. p. 1A. ^ "About MSD". Moscow, Idaho: Moscow School District. Archived from the original on 2015-09-01. Retrieved September 7, 2015. ^ City of Moscow. "Moscow City Council". Archived from the original on 2007-03-03. Retrieved 2007-03-25. ^ "NWS Spokane". NOWData. NOAA. Retrieved 29 August 2016. ^ "Monthly Averages for Moscow, ID (83843)". Weather.com. Retrieved 2011-11-29. Wikimedia Commons has media related to Moscow, Idaho.